The shift to digital as students opt for renting textbooks. Sizing and context for the market segments are provided for new course materials, new textbooks (print), digital media (including etextbooks) and used textbooks. The report discusses market segment sales estimates for the 2014-2015 academic year and provides segment sales projections through 2019. In the higher education landscape, change is touching every ivy-covered brick quadrangle and laptop station at Starbucks—wherever students learn. Where and how students acquire their post-secondary certificates or diplomas—and sometimes badges—increasingly varies just as does the description of the ‘traditional’ college student. Colleges and universities increasingly are putting more focus on ensuring that students successfully complete their degrees and do so in a reasonable amount of time. The freshman flunk-out course, long a staple for weeding out the non-college ready, is ceding ground. As a result, the course materials industry also is confronting change. Change is not just the migration from print to digital but how to offer and deliver resources that will help each student successfully navigate individual courses and move toward successful completion of a degree. 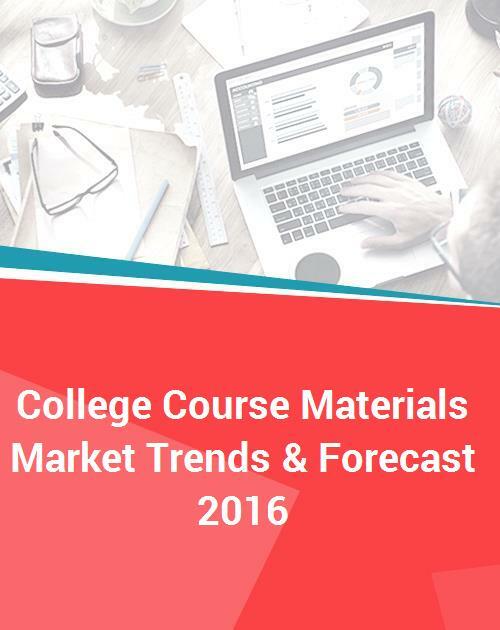 In College Course Materials Market Trends & Forecast 2016, Simba Information examines how the changing dynamics in the higher education market are impacting what kinds of instructional materials publishers are providing and how they are getting the materials to the students who need them.